Hello, it's time for Citzen Barnet's review of the year 2012. I use photographs I've taken throughout the year to illustrate an episode from each month of this year in the London Borough of Barnet, where we edged closer and closer to 'One Barnet' outsourcing bliss/blight. Grab a glass, enjoy, and happy 2013! January - you've been Johnsoned! In some ways, 2013 was the year of Boris and Brian (more, much more anon). 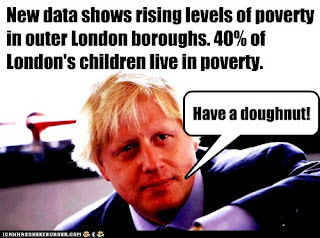 On Tuesday 17 January Boris Johnson hosted a TalkLondon/ElectBoris roadshow at the Peel Centre, Aerodrome Road. He bestrode the stage like a colossal ****. Brian Coleman, his GLA running mate, was effectively muzzled by being made chair for the evening. Still, no one could miss in the (too) well-behaved audience - although Coleman did his best to - a vociferous group in bespoke t-shirts protesting against Barnet Council's new parking regime: this was my first sight of North Finchley traders' leader Helen Michael whom I now count as a mate! A year can be a long time in politics. I didn't take a picture that night, so this month is illustrated with one of the odd pictures I made during his election campaign highlighting Boris Johnson's penchant for doughnuts and what I think of his politics generally: mouldy, old dough. February perversely was, as I remarked at the time, the month for three outdoor demonstrations! 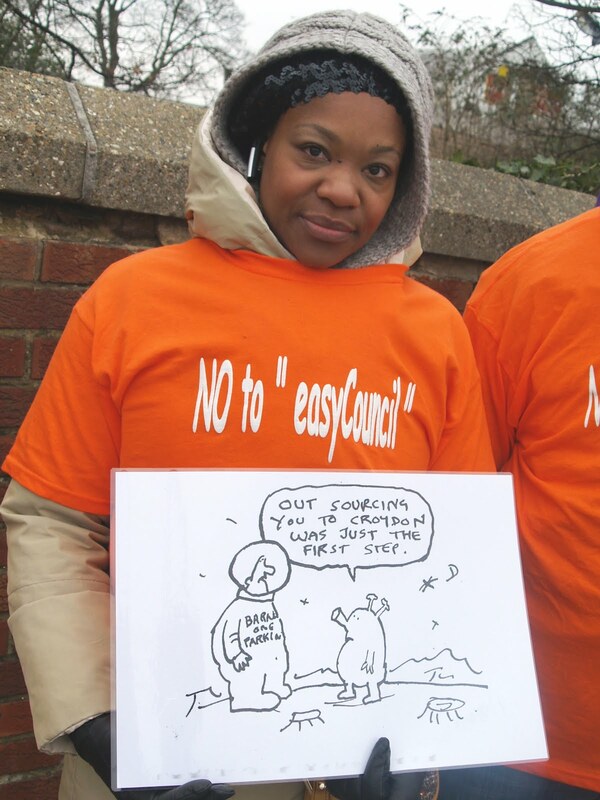 Around 300 workers due to be transfered to private sector employment under the council's "One Barnet" outsourcing plan will be taking their fourth day of strike action. They included 20-odd 'back office' staff of the parking service (pictured) - ultimately made redundant when NSL took over the parking contract (worth £15 million over 5 years) in May. On Monday 5 March Brian Coleman was found to have breached the councillors' code of conduct. A prize (of sorts) if you can guess how many months hence he will comply with his penalty. Also in March, Barnet Tories began to attempt to repair their electoral arses by announcing a review into their new disastrous parking regime, and choosing Brian Schama as their new mayor and Kate Salinger as his deputy. As the year goes on, we will see how little this was and too late. Monday 19 March saw the premiere of the film "A Tale of Two Barnets" by Charles Honderick (director) and Roger Tichborne (producer). The Phoenix cinema in East Finchley was packed out for this treat of a film which explored the lives, hopes and expectations of some of Barnet's residents as the borough gears up for the massive 'One Barnet' outsourcing programme. Little did we or - I suspect - even Charles and Roger know that 2012 would be so busy that it would require a second film by the end of the year! The picture below is of the orderly dole queue formed by protesters outside Downing Street on a warm Budget Day, 21 March. Foreground: Maureen Ivens, Save Friern Barnet Library group; background: Barnet Council Assistant Director Bill Murphy briefs an electrician on turning the power off. Barnet Council went ahead and closed Friern Barnet Library on Thursday 5 April but could not carry through their plan without resistance! Some stalwarts of the Save Friern Barnet Library group, bolstered by members of the Barnet Alliance for Public Services and one or two members of the local Labour Party, 'sat in' at the library for five hours after the planned closing time of 1pm. We even thought to improvise a Twitter hashtag: #OccupyFB. Prophetic in a way! On Thursday 31 May the Barnet Tories also lost a seat in a by election in Brunswick Park ward, left vacant on the death of former Council leader Lynne Hillan. The seat was won by one of the nicest men in British politics, Labour candidate Andreas Ioannidis. The Barnet Alliance for Public Services (BAPS) held its first AGM on Tuesday 12 June at the Greek Cypriot Centre in Britannia Road, N12. We have had an incredibly busy year, meeting almost weekly, organising talks, marches, stalls, and so on. We also have a swish new website, helped by sponsorship from some of the unions that are also opposing cuts and privatisation in our public services. 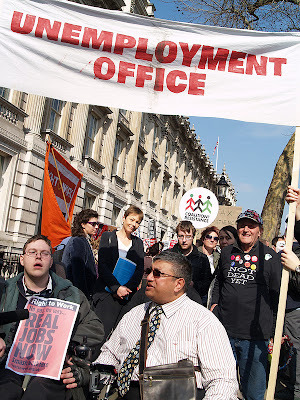 Barnet Council had a dishonorable mention at the House of Commons Public Accounts Committee in July for the number of senior executives it employs on contract rather than on the payroll (aka town hall tax dodgers), including its then deputy Chief Executive Andrew Travers. The Famous Five Barnet bloggers (who by now were having their elbows jostled by many excellent, new bloggers) wrote one of their year's many open letters on the issue. ...there can be little confidence that Barnet has the capability, and perhaps more worryingly the culture, necessary to meet the challenge posed by the letting and management of contracts that, under the One Barnet plan, will be far bigger than anything the Council has previously dealt with. In August, if you could drag your gaze from the sporting spectacles on the telly long enough, you would notice that Barnet Council leader Richard Cornelius got in a strop over One Barnet. While he was on holiday, senior officers let it out that one of the big contracts, Development and Regulatory Services, would be a Joint Venture, whereas Cornelius was not keen on this. For a while we could legitimately ask, and we bloggers did: who runs the Council, the elected politicians or the unelected officers? A few months later it was clear that the answer is the unelected officers, but they have to twist the politicians' arms first, as Cornelius too came out favouring JV. 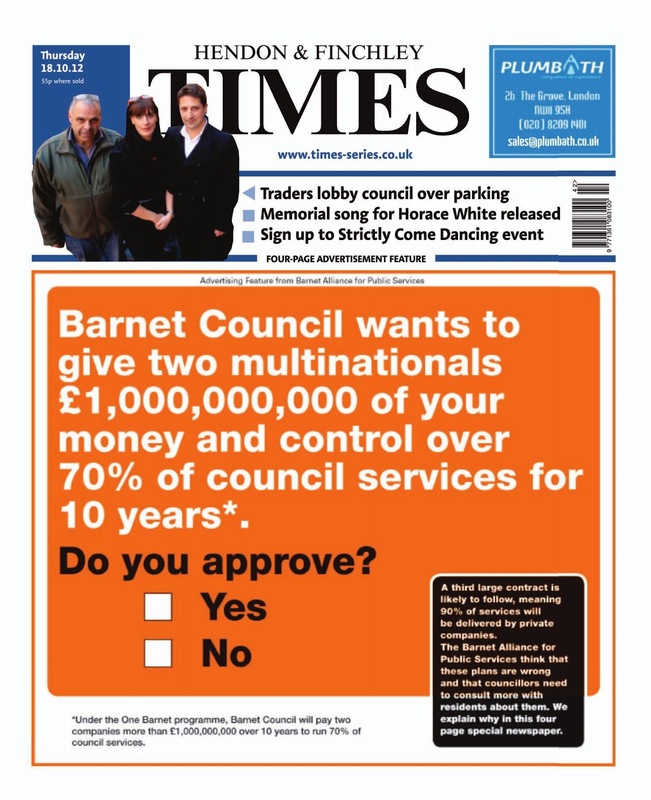 Of course, there is also the question of who the elected politicians represent, when they have never consulted residents over the whole principle of One Barnet, let alone which particular model it will take. But that is the theme of the last third of the year. In the meantime, here is a picture of Barnet Mayor Brian Schama showing his face at a community games on Grahame Park estate. Friern Barnet Library was re-occupied in September by people who know rather more about the business than we who attempted it in April; by activists of the Occupy movement. I've learned subsequently that they had little inkling of the battle that had raged and was still raging around the building, but a political compromise and cooperation with existing campaigns was quickly established, and the library re-opened to the public under workers and users' control, its shelves filled with donated books. Barnet Council quickly had the occupiers in court but hadn't prepared well, as it took them till December to get a possession order. October felt like the most torrid month in a torrid year, outside Barnet, where Jimmy Savile's paedophilia was exposed, and we had recently found out about the disgraceful behaviour of the establishment around the Hillsborough disaster, and, of course, all year the Murdoch newspapers cases rumbled on. But also in Barnet we had our own torrid autumn. Brian Coleman was involved in an alleged assault on Helen Michael; Barnet Tories shilly-shallied about how to respond, finally suspending him from the local party in November, but only after the national party had already stepped in to boot him out of its ranks. Barnet Council Chief Executive Nick Walkley (one of literary editor Boyd Tonkin's 'barbarian bureaucrats' for his role in closing Friern Barnet Library, and a chief architect of 'One Barnet') announced he was taking his bad haircut off to Haringey for a pay cut. He was replaced by his deputy Andrew 'Town Hall Tax Dodger' Travers. The Council thought better of outsourcing 'street scene' services, thus relieving residents of one massive headache. Brian Coleman finally apologised - very badly - for his insults to residents (see entry for March - if you guessed right, your prize is a warm, satisfied glow. Plus, please get in touch: your encyclopedic knowledge of Barnet trivia could come in useful for a fundraising quiz I am organising). Charles Honderick and Roger Tichborne's follow-up film "Barnet - the Billion Pound Gamble" premiered at the Phoenix on 22 October. The Barnet Alliance presented its petition calling for a referendum of residents over the One Barnet programme at a Council committee, the Business Management Overview and Scrutiny Committee, which finally asked some awkward questions - including of Andrew Travers. I helped design and edit a wraparound on the local newspapers which told residents more than they had ever been told before about the One Barnet programme. When I write up some notes on how we have run this campaign I will write in big letters WE SHOULD HAVE DONE THIS EARLIER! Brian Coleman became a saint of a kind yet still a sinner. He came out against One Barnet in an article in the Barnet Press. He also denied the charge of "assault [of Helen Michael] by beating and driving without reasonable care" at Uxbridge Magistrates' Court on 5 November - Coleman's case is due to be heard on Wednesday 6 February 2013. Richard Cornelius finally consented to address the public over One Barnet, at a meeting organised by BAPS on 8 November. His performance failed to impress even those who had come with an open mind, in a packed room at the Greek Cypriot Centre. Barnet Council workers learned that Capita had won the bid to provide a £750 million New Support and Customer Services Organisation (NSCSO) aka big call centre. They would soon find out that around 200 would lose their jobs which would be exported out of the borough. 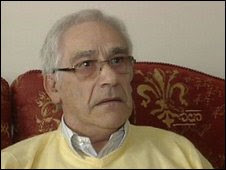 The Council learned of the first of two legal challenges to One Barnet, from John Sullivan on behalf of his daughter Susan. Barnet Alliance is helping to raise money to support this legal case and that of Maria Nash (announced in December). You can donate here. Many things came to a head in the final days of a frenetic 2012. Barnet Alliance disrupted the Cabinet meeting on Thursday 6 December where Barnet Tories took the decision to go ahead with the £750 million NSCSO contract (now transmogrified into a £320 million contract - I'm still not sure how: that's my homework). We could not sit by and watch this illegitimate decision go ahead without making a protest, albeit a token one. On Monday 17 December Barnet Council finally got a possession order against the occupiers of Friern Barnet Library but I understand the - on the face of it - dodgy judgment will be appealed. And the battle to save the library is, dare I say it, only just joined. On Thursday 20 December Barnet residents visited and protested outside the HQ of Capita in Victoria. I have a feeling that Capita will come to regret winning this contract. I for one will play my part in building a national campaign that turns the spotlight on the operations of the big public sector outsourcing companies in the way that groups such as UK Uncut and Occupy have successfully shone a light on the tax evading behaviour of the likes of Starbucks. 2013 looks like being as busy as 2012.